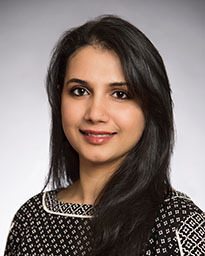 Dr. Divya Chirumamilla is a fellowship-trained pain medicine specialist with expertise in interventional pain medicine. She is a Diplomate of the American Board of Anesthesiology, with primary certification in anesthesiology and subspecialty certification in pain medicine. Dr. Chirumamilla received her medical degree at J.J.M. Medical College in Davangere, India. She completed her anesthesiology residency at Brookdale University Hospital and Medical Center in Brooklyn, New York, where she received the department of Anesthesiology’s Outstanding Resident Award, and at Massachusetts General Hospital/Harvard Medical School in Boston. Following residency, she completed a pain medicine fellowship at Beth Israel Deaconess Medical Center in Boston, where she received the Carol A. Warfield Award in Pain Management. Dr. Chirumamilla joined Mischer Neuroscience Associates from Harvard Medical School, where she was an instructor and served as clinical faculty in the department of Anesthesia, Critical Care and Pain Medicine.